Set along the international route E30, linking Warsaw with PoznaĹ and Berlin, only 12 km from the center of Warsaw, the 4-star Hotel Mazurkas offers its guests unforgettable stay in a friendly atmosphere. 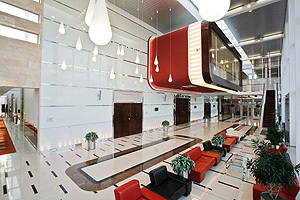 The International Fryderyk Chopin Airport is 11 km from the hotel. Nearby guests will find Aquapark with swimming pools and artificial river. Hotel Mazurkas features 158 spacious, comfortable, rooms as well as room for disabled people. All rooms are quipped with satellite TV, individually controlled air conditioning, telephones in bathroom and bedroom, wireless Internet access, mini bar, anti-allergic linen, and fire alarms. The elegant and romantic restaurant (80 covers) serves Polish and international dishes prepared by the cooks under a watchful glance of the Chef. Guests will keep fit in a modern air conditioned body building gym or relax in a solarium, dry and steam sauna. There is a modern beauty parlor in the hotel. The hotel accepts the following credit cards: VISA, MASTERCARD, AMERICAN EXPRESS, POLCARD, EUROCARD. In case of hiring for less then 8 hours the prices are negotiable. The hotel is situated at the International route E30, leading from Warsaw to Poznan and Berlin. There is an easy access to EXPO Warsaw Centrum and the Old City.